For us mamas the only thing better than getting something FREE is bragging about our little sweethearts. This month, you get to do both when you take part in a giveaway that is being sponsored by Embraezie Boutique. 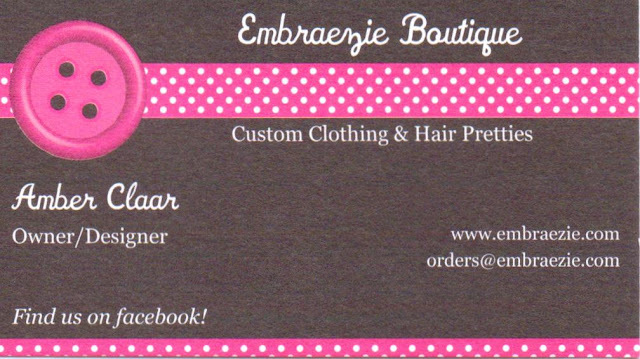 Embraezie Boutique is owned and operated by a local stay-at-home mom. Be sure to visit her website to see all the adorable custom clothes she creates! Here are the details - Go to Embraezie's Facebook page (click "like" if you haven't already) and enter a photo of your child modeling their Embraezie items (it can be as simple as the little $1 flowers!). Then on the 16th, voting begins. You'll want to encourage your friends and family to like Embraezie's page as well as vote for your child's photo. If you don't have any Embraezie products yet, here is a way to get in on the fun. Submit a picture with your little one & something to show Embraezie some love! Maybe just a little sign with I ♥ Embraezie! Then click our share button to the left, so your friends & family can get in on the voting. The child with the most votes will win a $25 gift certificate for Embraezie Boutique... but, if they hit 800 fans, Embraezie will be giving TWO $25 gift certificates away!! So be sure to tell your friends!